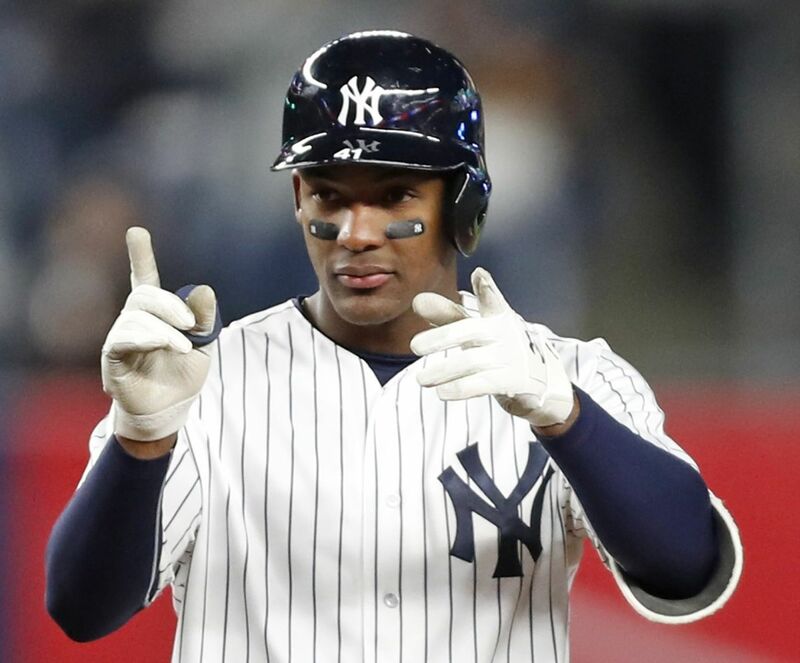 Miguel Andujar’s 2018 arrival in the big leagues on April 1st had been much anticipated by Yankee fans and we were rewarded with a Rookie of the Year performance by one of the most exciting players in all of Major League Baseball. One of the most exciting, and, for Yankee fans, currently one of the most controversial players, Andujar has polarized fans as a result of his defensive shortcomings. On the strength of his offensive firepower, Andujar was twice Rookie of the Month in the American League (June and August), but finished the season with the worst defensive metrics for a qualifying third baseman in the league, according to Fangraphs. The result of Andujar’s glaring split in abilities is that in an offseason rife with rumors about trade opportunities, fans don’t know whether to value him for his offensive production or trade him for his defensive deficiencies. The starting pitching market opened up recently with Seattle and Cleveland offering their elite pitchers for trade. Andujar’s name has come up in numerous rumors and reports on possible trade opportunities for the Yankees to upgrade their starting rotation. Muddying the waters is that Manny Machado is a free agent with the type of generational talent that the Yankees should be reluctant to pass by. Should the Yankees trade Andujar, for example, for a starting pitcher of the level of Cleveland Indians’ RHP Corey Kluber or Seattle Mariner’s RHP James Paxton, Machado, himself a four time All Star and two time Gold Glove winner, could be acquired to fill and upgrade the third base position. I wonder how it even came to this, to the point where I would consider Andujar in any trade after posting a .297 average with 27 home runs, 97 RBIs and breaking Joe DiMaggio’s franchise rookie doubles record and then tying the American League rookie record with 47 (Fred Lynn 1975 shares the record). The Yankees 2018 season was marred by injury, particularly the injury of Judge in the second half of the season and Andujar, along with Giancarlo Stanton, helped carry the team during that time; however, the infield defense was a work in progress all season. Despite the Yankees winning 100 games, the infield defense was a liability that probably cost the Yankees games. Starting pitching was affected early in the season by the loss of Jordan Montgomery to injury and then to Tommy John Surgery. While the pitching staff had a successful season, especially after the addition of JA Happ, it was punctuated by some inconsistent performances by pitchers such as Sonny Gray, Lance Lynn, and even, at times, Luis Severino, and that was certainly reflected in the number of wins and also by falling nine games short of a division win. The Yankees, as a result, are on the market for starting pitching. Who better to fill pinstripes than elite pitchers, such as Corey Kluber, Carlos Carrasco and/or James Paxton? A trade for an ace is necessary to upgrade the Yankee rotation to compete and win at the highest level. While Severino has been considered the ace of this staff for the last two seasons, his inconsistencies have fans re-considering his dominance and willing to acquire a proven ace. Andujar and Gleyber Torres are both Rookie of the Year candidates and both had obviously successful rookie campaigns, but neither are untouchable and have been asked for by potential trade partners. Torres, however, is signifiant to the Yankees infield plans in 2019, especially with the injury to Didi Gregorius that will sideline him until possible June. Andujar, therefore, must be considered in a trade for a starting pitcher, such as Corey Kluber or James Paxton. I would add that the Yankees would need to acquire Manny Machado to replace Andujar, if they wish to upgrade, and it would appear they must upgrade the infield defense. Andujar is the key to any trade this offseason that would result in an upgrade to the starting rotation and to the infield defense, two weak spots in the 2018 team. It will be interesting to see how serious the Yankees are about winning a World Series in 2019 by the moves that they make at the winter meetings coming up in just a month.